From our own experience, we know that our mind is where everything ‘happens’...first! It’s where we plan, create, envision and generate our responses to others. It’s the place in the inner space of our consciousness where our successes begin, our stresses are generated and failures shaped. Restoring Mental Mastery - Just about everything evolves through our mind, revolves around our mind and involves the use of our mind. That’s why it’s useful to check your level of mental mastery. Have you just surrendered to whatever arises, whatever is triggered, whatever arrives...in your mind? Are you the master of your mind or a slave to what’s on your mind? 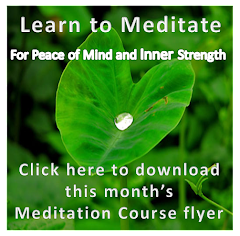 For thousands of years in India, the primary practice for mental mastery has been the art of meditation simply because meditation returns us to our deeper ‘inner space’, our most natural state with inner peace and power that is prior to the mind, prior to thinking. It is a state of consciousness where there is no need to think. However, our thinking is shaped naturally there by the wisdom of our heart and the purest vibration of the energy of our consciousness which we know as love. Levels of Reality - However, it is not possible to remain in our ‘inner space’ until the mind is mastered; there are three insights to it: 1) you are a being of consciousness and mind or thinking is one of the ‘faculties’ of you; 2) the mind is like a window through which images of the physical world ‘out there’ come ‘in here’ to the non-physical awareness of consciousness i.e. you; and 3) There are five levels of reality linked to our mind; a) the world as it is (without any interpretation); b) what you consciously focus on in the world before interpretation; c) your interpretation of what you focus on; d) your inner world of beliefs and memories (close your eyes and daydream/remember/judge the memory of another); and e) you (the one that is ‘doing’ all the above, the one who is creating the other four levels of reality!). However, we need to be able to discern and decide how to engage with that world in ways that are beneficial to the physical health of our body and to the wellness of our being! Don’t Get Lost in the Movie! - Becoming the master of your mind, with the ability to discern the different levels of ‘reality’, requires the practice of ‘detached observation’. This is also the main/primary step in the practice of meditation. It can be likened to sitting in the movie theatre but not losing the awareness of one’s self as ‘the viewer’ of the changing colors and forms on the screen; not easy for most of us as we believe the whole point of going to the movies is to lose our self in the movie and to escape from the reality. In meditation, like in the movie, the self becomes aware that, ‘I am simply observing whatever is happening on the screen of the mind’. As a result, you become aware of two things: first, Inner peacefulness that brings a feeling of stability and serenity and second, a growing awareness of your self as the master of your life. Auto Interpretation - During the process of developing the practice of ‘detached observation’ you will also start to notice how you automatically interpret and filter whatever you see with your physical eyes, and feel with your subtle senses, according to previously formed beliefs and experiences. This we know as ‘perception’. The more you ‘notice’ this, the more you will become aware of your own biases and prejudices and more you can shed perception and become ‘detached observer’. The practice of meditation and mindfulness are therefore essential to mental mastery i.e. being the master of your first faculty which we call ‘mind’. Being is Deep - Being the master of your mind means living by your consciousness and not living in your mind. Meditation is essentially the practice of living from the depths of you, from the depths of your consciousness. From the depths of YOU, you can see and you can receive the world as it comes into and onto your mind. Yet, you are also able to remain calm and quiet, cool and peaceful, and therefore you are able to bring the wisdom of your depths, sometimes referred to as the wisdom of the heart, to bear as you consciously create your response to ‘what’s on your mind’! Action - Take five minutes every day and consciously detach your self from what is going on in your mind. Notice exactly when you are pulled back into what’s on your mind.